Heat a medium skillet on medium heat. Add oil and sauté 3 of the scallions about 2-3 minutes. Add egg whites, season with salt and pepper and cook, mixing with a wooden spoon until cooked through. 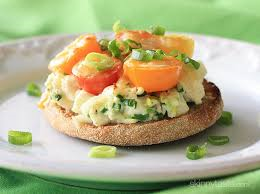 Divide on toasted muffins and top with tomatoes, cheese and remaining scallions.